We have mentioned previously in this series that some bequests in wills can seem strange to our modern eyes. 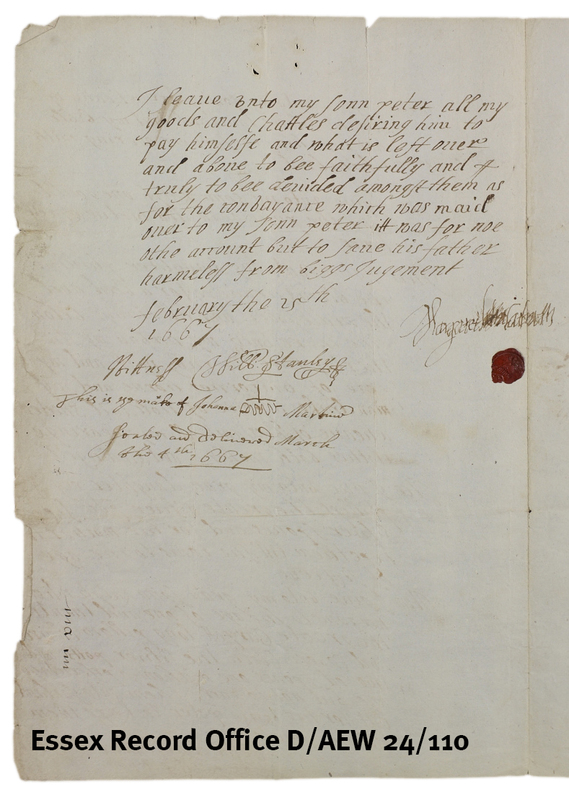 More examples can be found in the will of Margaret Lathum of Upminster whose will is dated 25 February 1667/8 (D/AEW 24/110). 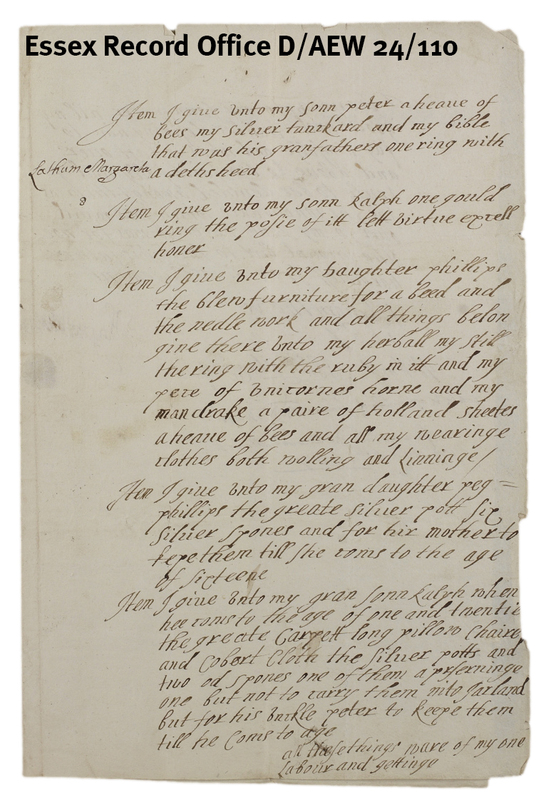 This must have been left until close to her death as it does not begin with the usual sentence In the name of God Amen but rather by listing her next of kin and the possessions she wished to give them. A will of this type is known as a nuncupative will or an oral will and would have been written down as soon as possible. Margaret appears to have been the widow of Ralph Lathum, who had died the previous year. In his will (D/AEW 24/95) he left her fower howses. These may be mentioned in the deed referred to on the last page of her will; she held more property than would be clear from this will alone. In between more mundane requests she leaves to her daughter Phillips (no first name is given) my herbal my still … my pece of unicorns horne and my mandrake… According to the Oxford English Dictionary, herbal could mean either a book on herbs or plants, or a collection of them. It seems more likely that it was the latter as her still would be used for extracting the essences of plants. The ‘unicorn’s horn’ (really a narwhal or rhinoceros horn) and mandrake would have been used for medicinal purposes. It wasn’t unusual for testators to bequeath items with conditions attached. Those for Margaret’s grandson Ralph were to be kept by his Unckle Peter until he came of age rather than carry them into Iarland [Ireland]. This of course raises the question of why he was going to Ireland, which the will can’t answer. You can access Essex Ancestors from home as a subscriber, or for free in the Searchroom at the ERO in Chelmsford or at our Archive Access Points in Saffron Walden and Harlow. It will shortly be provided at Waltham Forest Archives. Opening hours vary, so please check before you visit.